Chelsie Springstead | Milwaukee Workers Compensation Defense Attorney | Lindner & Marsack, S.C.
Chelsie D. Springstead is a partner with the law firm of Lindner & Marsack, S.C. Ms. Springstead’s current legal practice is focused on defending worker's compensation claims for the insurance industry and self-insured employers, along with handling subrogation and Medicare issues. Prior to joining Lindner & Marsack S.C., Ms. Springstead was an associate at Cermele & Associates, S.C. where she represented law enforcement officers in worker's compensation claims, grievance appeals, citizen complaints, First Amendment issues and claims under the FMLA and FLSA. Ms. Springstead received her law degree from Marquette University Law School where she also earned a Certificate in Dispute Resolution and her undergraduate degree from the University of Illinois where she double majored in English and Speech Communication. While in law school, Ms. Springstead worked as an intern for the Waukesha County Public Defender's Office and the Milwaukee County District Attorney's Office. Ms. Springstead is a frequent speaker and lecturer on worker’s compensation, labor and employment law, and Medicare-related topics and also provides training to employers and insurance carriers in these areas. She is a member of the Lindner & Marsack worker’s compensation defense team which received a ‘first tier’ ranking by U.S. News and World Reports. 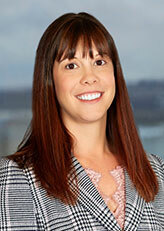 Ms. Springstead is licensed to practice law in the State of Wisconsin and is admitted to practice in the United States District Courts in the Eastern District of Wisconsin. She is a member of the Wisconsin Bar Association, the American Bar Association (ABA), the Milwaukee Young Lawyers Association (MYLA), the Wisconsin Association of Worker’s Compensation Attorneys (WAWCA), the Milwaukee Insurance Adjusters Association (MIAA), the National Worker’s Compensation Defense Network (NWCDN) and the National Association for Subrogation Professionals (NASP). She is also currently the Treasurer of the Wisconsin Association of Worker’s Compensation Attorneys and Secretary of the Wisconsin Worker’s Compensation Forum Board. National Society of Collegiate Scholars.